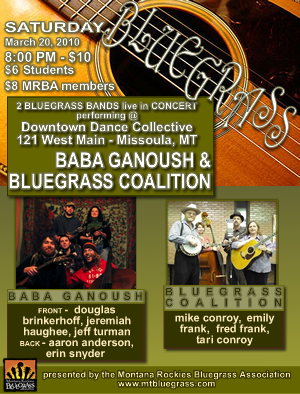 The Montana Rockies Bluegrass Association isÂ presenting an evening of bluegrass music on Saturday, March 20th, at the Downtown Dance Collective, 121 West Main Street, Missoula, MT. Two bluegrass bands will play the show. Baba Ganoush, a band with diverse members that find common ground in a love of homegrown music and a wish to share it with a broader audience, will open the show at 8 p.m.. The Bluegrass Coalition, a newly formed group featuring the up-the-creekÂ traditional style of Mike and Tari Conroy and the driving more modern style of Fred and Emily Frank, will play at 9Â p.m.Â Tickets which are available at the door are $10 for the general public, $8 for association members and $6 for students. For more information visit www.mtbluegrass.com or call 777-7028.